It may have been a school night (even for me, the Vault’s resident grad student), but last Tuesday night, three bands on their final stop of their tour rocked the Music Hall of Williamsburg ‘til after midnight to an equally raucous crowd. Headliners Atlas Genius wouldn’t even hit the stage until just before 11, ceding it first to two up-and-comers: New York’s own Mainland and DREAMERS, who both kept our attention, albeit with wildly different sets. First up, the indie quartet Mainland whirred through a set of upbeat, punky-pop tunes, each sassier than the next. They opened with “Not As Cool As Me,” a nonchalant kiss-off to a controlling ex that sounds plucked out of the ’80s with the thick, snarling guitars and bouncy synth lines. Frontman Jordan Topf had the audience clapping along immediately, and they made quick work of moving through a batch of songs that sound as if The Cure hailed from sunny California. New single “Outcast” was an attention-grabber, pairing its downcast lyrics with buoyant, driving melodies. Following Mainland was a band of a different stripe; DREAMERS occupies a space somewhere between grunge and punk-pop insouciance, each song jammed with a kaleidoscope of melodies that shimmers as it unfolds. Their lead single “Wolves” has made its way onto radio, and for good reason: it’s somehow weighty yet breezy, chock full of driving guitars and an indelible chorus that had the audience singing along on first listen. The trio just finished cutting their first album, so keep an eye out! If the crowd wasn’t sufficiently energized by then, the arrival of the main event of the night got everyone on their feet. 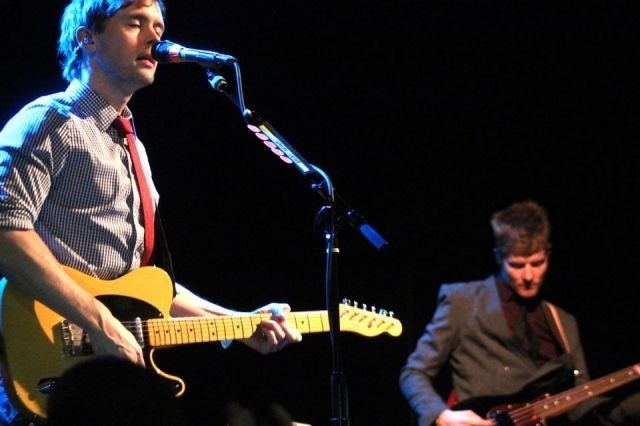 Australia’s Atlas Genius is made up by the Jeffrey brothers—Michael on drums and Keith on lead vocals and guitar, rounded out by Darren Sell on keyboard. They’re currently touring in support of their largely excellent new album, Inanimate Objects, which has taken the solid, if not groundbreaking sound of their first disc and fleshed it out to sound more mature and more intentional. After launching out with atmospheric, slow-building album opener “The Stone Mill” and lead single “Molecules,” which soars on a backdrop of synths and a breathless chorus, I had the hope that the band would regale us with the new album in its entirety. Indeed, part of the strength of Objects is that it’s synced so well, each track blending naturally into the next. While much of that material showed up, they did also throw in some jams from 2013’s When It Was Now, including “If So” and, of course, megahit “Trojans” as a closer. But the best moment of the night for me was actually a tie between two standouts. First up was hearing my favorite song from Inanimate Objects (and actually the song that got me into this group), “A Perfect End.” This cut has got to be released as a single; it’s catchy and anthemic, with a gloriously cathartic chorus (“So let it fall / And watch it break into shards of light and gold / A perfect dance / All eyes fixated on new dreams, cascading / It all starts again, cascading”). In close competition, though, was Atlas Genius’ cover of Dead Or Alive’s “You Spin Me Around (Like A Record),” which they plucked right out of the ’80s and gave a rocking makeover, speeding it up so that the crowd became one big dancing whirlpool. And of course, they sent us off into the night with “Trojans,” pausing to restart the song so that the whole audience could sing along. We stepped out of the Music Hall of Williamsburg into a drizzling night, which quickly became a downpour, and it was an exhilarating run through the rain on a Tuesday at midnight with three great bands’ worth of music pumping through our bodies.